The unrivalled Underbelly Festival returns to South Bank, between the Southbank Centre and London Eye, from April 2019, presenting over 70 shows for five months of comedy, cabaret and children's shows. In a temporary theatre - surrounded by street food and one of London's biggest outdoor bars - you'll find London's largest programme of affordable circus, cabaret and fringe theatre. Festival highlights this year include a month long residency by Gravity & Other Myths who bring their stripped back circus show to the South Bank. Join Bernie Dieter at the Little Death Club for some debauched kabarett, see drag extravaganza Yummy and listen to a new Podcast Live season with A Gay and A Non Gay and Hoovering Podcast on the lineup. Take the children to see stage adaptations of MONSTERSAURUS!, Shark In The Park and Elmer The Patchwork Elephant, as well as The Gruffalo, The Witch, and the Warthog with Julia Donaldson at the biggest ever Family Fest running throughout the Easter holidays. 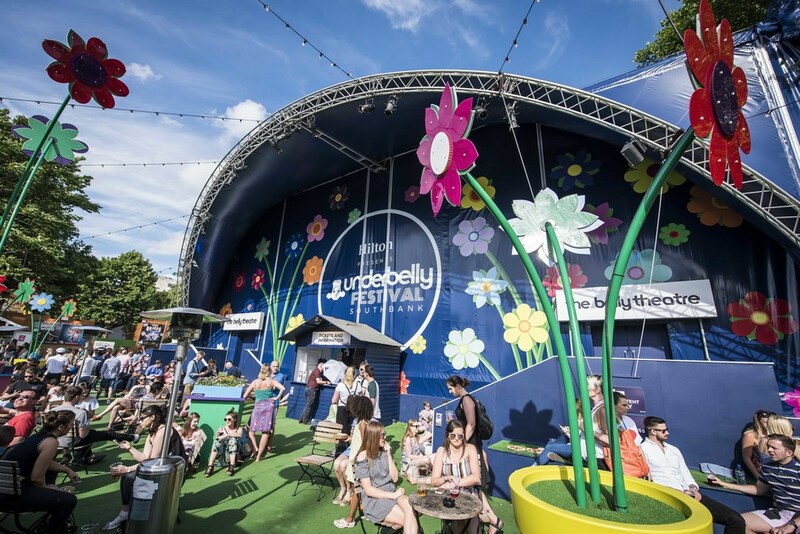 What are the best dining options near Underbelly Festival London? Underbelly Festival gyms, sporting activities, health & beauty and fitness. The best pubs near London Underbelly Festival. Underbelly Festival clubs, bars, cabaret nights, casinos and interesting nightlife. Where to have your meeting, conference, exhibition, private dining or training course near Underbelly Festival. The drag artists and pianist collaborate in a cabaret performance. Existential musings from John Robins, plus Steve Bugeja, Laura Lexx, Stephen Bailey and Ed Night. From cheap budget accommodation to luxury 5 star suites see our deals for Underbelly Festival hotels, including Corinthia Hotel London from 97% off.